Eleven years ago, I met this boy. His name was Mark and he changed my life. You see, when I met Mark, I was a 17 year old Senior in high school and hadn't eaten any meat for 5 years. I had been dating Mark for a few months during the summer before I started college, and one thing I learned about Mark during that time was to not mess with him and his appetite. To this day, he will give me a heads up that goes something like, "babe, I'm just letting you know, you have like 40 minutes to figure out what were gonna eat." Yup. That's my husband. So one day, Mark and his appetite decides to pull in to an In-N-Out and says, "I'm gonna get a "Double-Double," what do you want?" He knows I didn't eat meat, but also knew that I was tempted because his burgers always smelled sooooo goood and BACON. I really really missed BACON. Hahaha! Well that was the day that I gave in to temptation and ordered a "double-double" of my own. It was delicious! Eleven years have come and gone, and probably hundreds of burgers have been eaten between the two of us. This weekend was the eleventh anniversary of when Mark and I first started dating. Although he had no idea that it was our anniversary or the symbolism of choosing In-N-Out for lunch on that day, I really enjoyed my lunch with my family. 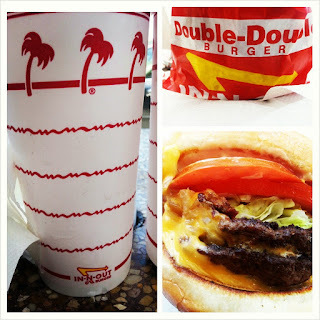 So much has changed in those eleven years, but thankfully the delicious Double-Double from In-N-Out has not changed one bit.